On the interesting Blog of M0XPD is a very interesting article about WSPR experiments with the RPi. Read the article: Raspberry Whispers by M0XPD. I just visited the WSPR data base to collect a list of WSPR spots. And made an Analysis of the WSPR spots that M0XPD made on 30 meter with a power of 200 mW. The stations that are mentioned in the article Raspberry Whispers have Excellent Ears. (Sensitive receivers) The lower the Calculated Field strenght in the better the propagating or the more sensitive the receiving station. The distance is given in steps of 100 kilometers. A distance of 250 to 349 km will show up as 300 km. PI4THT at a distance of 635 km, is placed in the category 600 km. To compare spots, that are made with a different power (dBm), I calculate the lowest possible power of each spot, using the SNR and the power (dBm) of the transmitting station. To compare the spots of stations at a different distance, I calculate the Field strength of each spot. This calculation includes the distance in km. In the table, I chose for microVolt/meter, to get nice values. For one receiving station, the changes in Field strength follow the changes in the propagation to that station. The lower the Field strength, the more sensitive the station. The RPi is working well. Yesterday morning my wife and I went for a walk around Plas Middelwaard. At the last moment I grabbed the camera. The low temperatures formed intriguing ice structures. At first it was overcast, but later the sun came through. I discovered how I can adjust the camera for a close up. As you can see in the jellyfish that was formed by nature. Later we visited a fish shop. Here I took the last icy picture. I enjoyed working with my new Inverted Vee in the HA-DX contest. At the end of 2012 Walle PE2WJW repaired my antenna which was damaged in a storm late November. The HA-DX contest was the first DX contest, in which I could test the new antenna. The new antenna works well. When I started on Saturday afternoon on 20 m, I heard HA8MD with S8 +20 dB, so I immediately made a QSO with just 8 mW. This first QSO was also the QSO with the lowest power in this contest. After that I made 4 more QSO's with very low and very low power: HA8IB - 36 mW, RA3RFA - 800 mW, UA2FL - 36 mW and HA1ZH - 360 mW. A very good start. After that I got on the bike, because it was sunny whether. On Sunday mornong I made QSO's on 40 m, 20 m and 15 m.
In all QSO's I used the Lowest Possible Power with search and pounce in CW. So the used power in each QSO, is a very good indication of the propagation at that moment. When I use the lowest possible power, it not always easy. Sometimes I have to give my call many times before my weak signal is heard. The frequency must be absolutely clear. I enjoyed participating in the IARU HF World Championship 2011. After I came home from my holiday, I discovered that I had not sent in the Log. At first I was disappointed, but then I realized that the activity that the contest offers, provides the opportunity to make interesting QSO's. I had great fun with QRP and QRPp in 125 QSO's, of which many are 1000 Miles per Watts QSO's. Despite the deadline I sent in. At the time I sent in the Log, I wondered whether my log would be marked as check log or would be ignored. The contest robot immediately replied with a e-mail, in which he stated that the Log was received ***AFTER DEADLINE***. And in the same mail the robot kindly thanked my for participating and for submitting the log. hi. 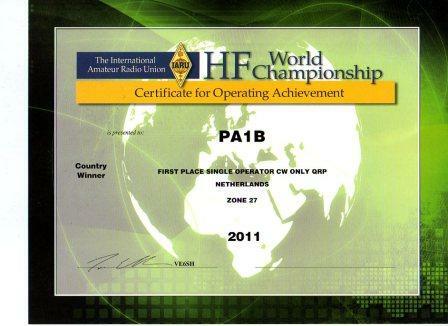 Award for the IARU HF World Championship 2011. It's great fun to participate with QRP and QRPp, but it's even more fun to receive an Award. I very much like this gesture of great sportmanship.